Have You Used Thoroughbred Connect? Thoroughbred Connect is an emergency-call-card for racehorses. In 2011, I wrote here about the Jockey Club’s Thoroughbred Connect, a web site that was designed to allow fans (or concerned parties) the ability to attach their contact information to a horse’s registered name. The idea was that if you were watching a horse and wanted to purchase or take some sort of responsibility for him after he was finished racing, the owner or trainer could just log into Thoroughbred Connect, pull up the horse’s name, and pick up the phone and give you a call. A year and a half into the project, more than 1,600 people have signed onto Thoroughbred Connect, and more than 400 horses have benefited from the program, according to Kristin Leshney, legal associate with The Jockey Club, who helped develop the platform. 400 horses have benefited from Thoroughbred Connect. Do you know one of those horses? I had my name down for four different horses, and of those four, I only know where one of them is. I’m always hoping someone will get in touch with me, though. It’s the best way I know to permanently attach my name to their names. It’s like an “in case of emergency” card for a racehorse. How about you? Have you had luck? Have you been disappointed? Are you still waiting? Are you one of the owners of the 400 Thoroughbred Connect Success Stories? We want to know. A writer is looking for stories of people who have used Thoroughbred Connect — successfully or unsuccessfully — to be used in a racing publication. Contact her at patti@davismedpr.com or DM on Twitter @shuveeIL if you’ve got something to say. I really, really wanted Thoroughbred Connect to work. I still think it can. So if you have something to share, please do so! Trendy. Just saying it out loud all by myself makes me think of the Sixties – the Swinging Sixties. Petula Clark singing Downtown, Anthony Newley’s bell bottoms, Sidney Poitier in To Sir with Love, Mary Quant’s make-up, and of course Twiggy – the racehorse lean model. So, what in the world does this have to do with off track Thoroughbreds? Allow me one more digression and I’ll spill all. I am totally non-uniquely qualified to write this column. You are totally non-uniquely qualified to read it. We are both totally qualified. We are card carrying members of the twenty-first century world of consumers, readers, and horse-centrics (you can interpret centrics as either meaning eccentric or meaning centered and preoccupied by). I feel like I am a sponge for middle of the road trends in North America. Neither a trend setter nor a total trend laggard. I mean, I like something on Facebook or on the web and look at the hits and see that millions or mere hundreds of thousands of me-like creatures are piqued by the same thing. So, I have to ask all of you something. Do you feel like there is a rising tide of references to off track Thoroughbreds? More accolades for off track Thoroughbreds? More purchases of off track Thoroughbreds? More attention being paid to off track Thoroughbreds? For instance, the growing popularity of blogs such as this one or of Susan Salk’s wonderful Offtrackthoroughbreds.com? Sarah K. Andrew's Horses and Hope Calendar raises money for One Horse At A Time; frequently, OTTBs are pulled from Camelot's kill pen. Or, the totally viral response to Steuart Pittman’s Retired Racehorse Retraining Challenge. A cyber phenom that translated into a live bodies on the ground phenom at the PA Horse World Expo in Harrisburg. See for instance, Sassy Grey blog, Sarah Andrew blog. How many off track thoroughbred lovers were tuned into Sarah Andrew’s wonderful shots from Camelot? How many of the $37,000 plus in charity donations from sales of her calendar (that’s approximately 2500 purchases at $15 a pop) were fueled by OTTB driven dollars? Plenty, I’d imagine. How many people who bought copies of Raja Racehorse are far above the targeted reader age of 10-12? C’mon fess up. I know you’re out there believing in him. I’ve even clambered onto the band wagon on behalf of CANTER New England and the New York Chapter of ReRun. Both are volunteer driven organizations. Both are in great need of funds to sustain the work they do. So, tapping into the spirit of doing good by looking good we created two cool caps with five dollars from each sale going to help CANTER NE and five dollars to help ReRun NY. The doing good by looking good award in the equine couture category goes to Caitlin Taylor with her OTTB Designs. Individually made by Caitlin each luxuriously embroidered saddle pad (and now coolers) has thousands of gold stitches celebrating the regal heritage and athleticism of the OTTB. Caitlin has had huge demand from enthusiastic riders who want to show their OTTB pride. And did I mention, Caitlin donates a percentage of the price of each pad or cooler to the Thoroughbred charity of the buyer’s choice? The Chronicle of the Horse seems to have beefed up its coverage of Thoroughbreds. For instance Allie Conrad of Canter Mid-Atlantic has been contributing wonderful blog columns. Is this déjà vu all over again for decades long subscribers of the Chron? The Jockey Club’s Thoroughbred Incentive Program may be the lever needed to move mountains. Its Thoroughbred Connect has proven enormously helpful. These two initiatives each deserve their own blog entry. In the meantime, check out the informative websites. Another initiative from the racing side of the aisle, the Thoroughbred Aftercare Alliance deserves a blog entry of its own. What its effect will be is still an unknown. Thanks to the suggestion of a reader Ray Paulick recently began devoting part of his report to off track thoroughbreds. Three Chimneys Farm, where Seattle Slew last stood, where Dynaformer, Smarty Jones and other horse-centric household names live, is calling attention in its advertising to lesser known Thoroughbreds and lauding their off track accomplishments and value. Sadly, this is not immediately evident on their website homepage. The New York Thoroughbred Horsemen’s Association, NYTHA, is seeking video footage of OTTBs performing over fences in post-racing careers. However, neither the home page, the benevolence page, or elsewhere in a quick search of their website was there any mention of off track Thoroughbreds. We are waiting with bated breath. Eaton Sales, a company that makes money by selling young Thoroughbreds for racing purposes, is showing an interest in OTTBs. If this market savvy company, wants to be seen with OTTBs, is it trend time? Is this Business Time as Flight of the Conchords might say? This is just what I pluck out of the air. Air increasingly humid with OTTBs. So, it’s time to get scientific (or at least organized and persistent). In the spirit of Steuart Pittman’s retraining challenge. I am mounting the Thoroughbred Trend Tracking Challenge. I am going to track via Google alerts key phrases like OTTB, retired racehorse, off track Thoroughbred, and Thoroughbred. I’ll report back to you in five weeks on what the tracking reveals. Will it be the usual suspects floating repeatedly across the screen? Will new references come up? What will the content consist of? What enthusiasms will go viral? Will interest translate into any changes in conditions for off track thoroughbreds? The market for them? Opportunities for them? What new and surprising developments will emerge? I’ll report back during the week of April 2, 2011. Until then, Happy Thoroughbreds! This is a great report from the Today Show about getting off-track Thoroughbreds into new careers. If someone gifts you a Thoroughbred these days, you could be excused for taking a careful look inside his mouth. If the horse was ever entered into a race, he’ll have a unique tattoo, in blue dot-matrix pixels, concealed beneath his upper lip. Some quality time with the inside of your new horse’s mouth, quite possibly taking a photo to enlist the help of strangers on the Internet, and you might just be able to decode those numbers and run them by the Jockey Club, who will cheerfully tell you your mystery horse’s name, free of charge. With a name, there is power. The power of pedigreequery.com, the power of Equibase, the power of Google. Without a name, you’ve got just another horse. In the olden days, the Jockey Club didn’t give out tattoo research results for free. They charged fifty bucks for it. Fifty bucks, to go into their files and find the number they issued. Even if they were riffling through a cardboard file box in a storeroom closet, it couldn’t possibly have cost them fifty dollars of time to connect the tattoo number with the name. But that was the policy. So when I took off Packin’ Six’s bridle, I did a casual flip of the lip. I got a line of blue numbers, still reasonably legible. The first letter confirmed his year of birth and the seller’s tale that he was only five years old. The numbers, though, didn’t tell me anything. Only the Jockey Club could have helped me with this mystery. His close-lipped sellers certainly weren’t telling me anything. “So where did he come from?” I asked, as the barefoot teenager stripped off the rag-tag saddle. One of the stirrups fell off and landed near my feet. I didn’t like to think about how different my ride could have been. “Oh, what does he do?” I asked, pushing the boundaries of what’s ‘friendly’ on a north-Florida patch of dirt. I took another good look at his front end. She was right. The horse had massive chest muscles. He looked like a WWE wrestler. I suppose Packin’ Six was a good name, compared to what he might have ended up with. Hulk. The Undertaker. The Rock. And fake names are easily changed. “But he was a stallion, right? He’s got a huge jaw.” Stallions, like tom-cats, get huge jowls that easily stand out from a more sleek gelding or mare. “A teasing stallion?” Teasing stallions are typically angry and dangerous, living a sexually-frustrated life as they check out mare after mare for a positive reaction before they’re sent to more expensive stallions to be bred. “Nah, my husband doesn’t say, he just brings ’em home and expects me to take care of them!” She laughed and went over to open the gate. “Put him back,” she said to her daughter, and the girl led the former teasing stallion across the grass and sand in her bare feet. He walked quietly next to her, thin tail swaying from side to side. He had a nice walk. He had a nice everything. Except a name and a history. And I guessed he’d never have either. Not the first OTTB name, like, from the beginning of time… the first OTTB was probably named something like “John’s Gray Mare” or “Hallingsworth’s Bobtail Bay,” and who wouldn’t love to show a horse named that? 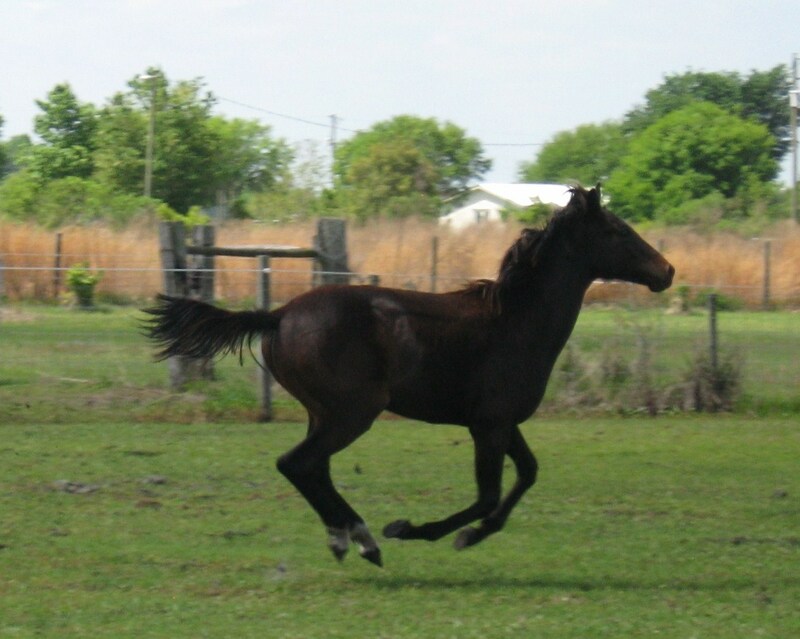 But the first OTTB for this Retired Racehorse Blogger, my dear, sweet, OTTB #1… Amarillo… sigh… Elbert. Yes, his first name was Amarillo Elbert. And throughout his show career, I never, ever called him that. How could I? How could anyone? Amarillo Elbert. Elbert. It’s animal cruelty. PETA would have been all over me. A trainer once told me I’d give him a complex for nicknaming him “Beast.” Imagine how he would have felt had I announced in public that his name was Amarillo… Elbert. We went through so many “show names” I can’t remember them all. I settled on Macnas, and you might have seen us go galloping by at Rocking Horse or Canterbury or even Basingstoke under that name. None of them ever fit. Maybe because his name was Amarillo, not any of the titles that I bestowed upon him, hoping something would stick. 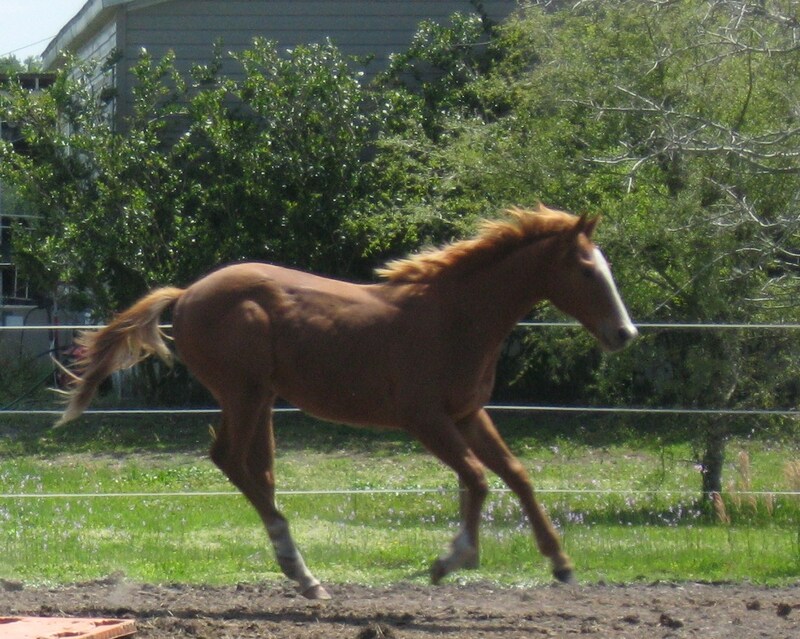 I’d had Rillo for six years by the time I got to Ocala, his supposed birthplace. I had a copy of his papers which I’d hung on to like a prize pedigree; it was all I had in those days to link him to his racing history. It listed him as a Florida-bred, and it listed his breeders’ name. When I went to work for a vet assistant who seemed to know everyone in the breeding business, I asked her if she knew the name. Right here? I was living a few miles from Rillo’s birthplace? Monumental. One hot afternoon, lacking anything better to do (or the discipline to actually do something, like ride a horse) I went into the tack room and flipped through the white pages until I found the breeder’s name. There it was, middle initial and everything, with a Williston exchange. I picked up the phone and called him. And that opened up a nice reminiscing session. 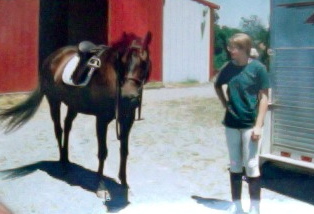 I told him that I loved his horse so much, that I’d had him since I was thirteen and the horse was a rescue. He said he was very sorry to hear that he was a rescue, but it didn’t necessarily shock him: he’d warned the young couple who had bought him that the horse’s knees didn’t make him suitable for racing. It was possibly more shocking that Rillo had not only had a decently lengthy career as a claimer, and then made it as preliminary-level event horse, with more than a few six-foot fences under his girth strap. And then I asked the question. Therein lies a tale, as there are with most horses’ odd names. It turns out the breeding had been a partnership with a man named Elbert… from Amarillo. A cowboy, a literal Marlboro Man (they said he was the original Marlboro Man, although I cannot confirm that), who into his senior years was still the king of the rough n’ready “Willard’s Steakhouse” in Bronson, the sort of cowboy bar that cannot be duplicated outside of true cattle country. And dear little Rillo had been named for him. I can’t say there wasn’t some hilarity in naming Rillo for a Marlboro Man. A horse who preferred the company of women, he had jumped into mare’s paddocks and then hid in the corner when they tried to beat him up on more than one occasion. He was terrified of miniature horses and suspicious of paints. (I am somewhat the same.) He would jump over picnic tables and round bales if they happened to land in his field of vision, but duck out of water hazards unless ridden hard and given no choice. He was gentle enough for small children to learn to ride on, but would pin his ears and threaten to buck if I played jockey and leaned up his neck during a gallop. And he had the most dainty, elegant trot, courtesy of those crooked knees, that his dressage tests were ballet dances. No matter how silly his name, it was his name, and I never could strip it from him fully. He was always Rillo or Riller or Rillo-man, or Amarillo if he was being particularly naughty, and all the fancy, frilly names that I tried to drape over him just lay across his back like ill-fitting rugs, as if wearing a plaid Rambo rug implied that he was, in fact, plaid. He wasn’t plaid, he was a plain dark bay, darker in summer, reddish in winter. He was Amarillo, some call Elbert, and that was just who he was. So first, Liz (@nythoroughbred) shares this great link at Chronicle of the Horse: “Celebrating Former Racehorses at Rolex,” and I get very excited reading it. Obviously it comes to no surprise to any of us that OTTBs are the best eventers (and everything else) but it is fun to see them get press for being so awesome. “I think it’s a great idea, but I think you’ll be disappointed about finding someone to award it to—Rolex horses have all been purpose-bred for the sport of eventing,” I was told. So Conrad had to inform the organizers (of Rolex? My heart is broken.) of the reality of Where Event Horses Come From, and she had some fun doing so, naming the 17 of 33 Rolex entries at the 2011 event. In her blog post she lists the horse as well as the horse’s Jockey Club name and sire and dam. Now, here is my question. Retired racehorse. Show name or Jockey Club name? If you’ve been reading here for a while, you know I’m on team Jockey Club name. Bon Appeal, Final Call, and all my broodmares – they’ve always been referred to by their Jockey Club names. I think we should all be on Team Jockey Club name, and this is why: I think it would be easier to track great sport-horse bloodlines and successful OTTBs if their names didn’t change. Shiraz: ridden and owned by Colleen Rutledge. His Jockey Club name is “Bold and Burley,” by Gallapiat out of Bold Blossom. He raced 14 times with 2 wins and just over $14,000 in earnings. Gallapiat isn’t the most familiar of names. But this horse produced my amazing mare, Gallapiatsprincess, who was the toughest tank of a horse you’d ever run across – with an amazing trot, to boot. She had two foals for us, Princess For A Day and Sunset Park, both of whom were built just like her – wonderfully sound, compact bodies, the picture of toughness, with worrisome levels of intelligence and arrogance. In short, awesome sport horse prospects. Would I seek out another Gallapiat for eventing, knowing this? Hell yes I would! Would you? Probably not, because you didn’t know one personally, and you didn’t know Shiraz was one! That’s my argument. Give me yours. You might have seen the articles sprouting up about the Jockey Club’s new Thoroughbred Connect, an online function which is supposed to be “connecting Thoroughbreds with their futures.” I felt a little skeptical at first; I mean, the Jockey Club has never shown the least little interest in tracking Thoroughbreds – their whole function is to register foals bred and maintain the stud book. What they do after they’re born and duly noted in the registry books, or produce offspring, is their own business. But eventually my curiousity got the better of me and I decided to log in and check it out. And hey! It turns out that it’s wickedly simple to use and gives me the one thing I wanted: a chance to help the horses I’ve bred if they ever need new homes! Basically, you log into Interactive Registration. If you aren’t already a member, all you have to do is come up with a name and a password. It’s one of the few things about the Jockey Club that won’t cost you a packet. 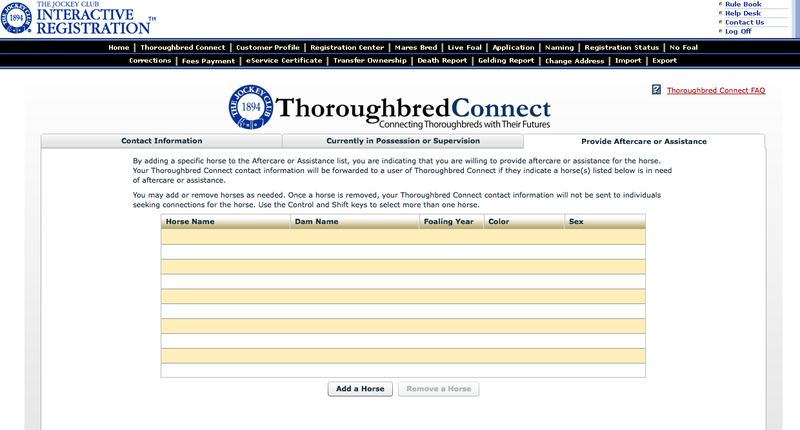 Once you log in, you click on “Thoroughbred Connect” up at the very top of the screen, and you’re prompted to enter your contact info. After that, you have two options: enter in the horses in your care (who may need assistance in the future) or enter in the horses you’re willing to offer assistance to. I chose the latter and the search option was simple: registered name, dam’s name, and year of birth. My four babies came up and were added to the list. And that was that! So now I suppose I just wait and hope no one ever contacts me, and my babies live long and productive lives as racehorses, and later as breeding stock or sporthorses. But if anything should ever happen to one of them, I want to know about it! I may not be able to take them in myself – I mean, I don’t exactly live on the farm anymore, do I – but I can at least work on their behalf to find them safe harbor and new homes. The Jockey Club has made Thoroughbred Connect so ridiculously simple that if any horse goes to auction or slaughter now, the guilty parties haven’t got any excuse. Not that they did before. But there’s simply no longer a reason for Thoroughbreds at the racetracks to “disappear” from the radar. Every owner or trainer should be registering their horses, and every breeder should be following up on them. Not to mention, it makes it very easy to put your name down for one of those campaigners you’ve been watching and longing for when their retirement comes! Keeping an eye on my babies!